Cultivate kindness & compassion for yourself and others! 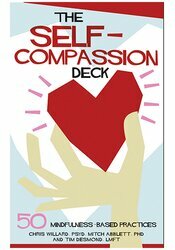 The Self-Compassion Deck offers 50 mindfulness-based practices for use at home, in the classroom, or therapy office. Commit to these easy, yet meaningful exercises in kindheartedness and gain a deeper appreciation for yourself and your life. Tim Desmond, LMFT, is a Buddhist scholar and therapist in private practice, and co-founder of Morning Sun Mindfulness Center in Alstead, New Hampshire. He is the author of Self-Compassion in Psychotherapy (W.W. Norton, 2015). He offers training and consultation to therapists around the world, helping them to integrate mindfulness practices into their work. Tim has presented at Yale University, the Institute of Meditation and Psychotherapy Colloquium, Greater Oregon Behavioral Health Conference, and the International Society for Ethics in Psychology and Psychiatry. His writings on mindfulness and self-compassion have appeared in the Psychotherapy Networker and the Mindfulness Bell magazine. Tim was interviewed about practices for self-compassion by the Huffington Post, and writes for major mental health websites such as www.Madinamerica.com. In 2005, Tim was ordained by Thich Nhat Hanh into the Order of Interbeing after many years of practicing in that tradition. He leads meditation retreats around the US and teaches regularly at Morning Sun Mindfulness Center. In addition to the tradition of Thich Nhat Hanh, Tim teaches Nonviolent Communication and Positive Psychology.